Hartarat Ha'azinu written in blue on the "parchment" background created by the artist. The arch made from the Hebrew prayer befor chanting the Haftarah is written in gold paint and supporting with delicate Rosebuds . At the base of the arch are two images taken from the Lisbon Bible as well as some of the birds nesting in between the Ivy. 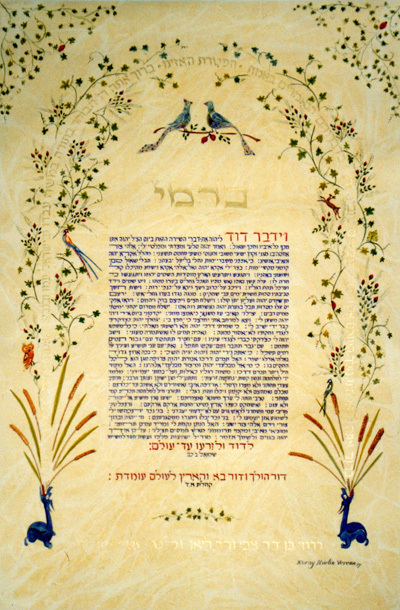 Above the text in Gold letters is the Hebrew name of the Bar Mitzvah and two Peacocks sitting on the Pomegranate branch.